I can’t believe it’s December already! 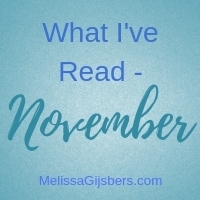 Looking at my GoodReads list, I read quite a few books during November, including some that aren’t on GoodReads. The first book I read was Trace by Rachael Brown. This is the book based on the Trace podcast, one that my 16 year old introduced me to. While the book had a lot of information that was in the podcast, it also had some ‘behind the scenes’ details that was fascinating. The next book was Ladies in Black by Madeleine St John. There is a movie out at the moment based on this book. I haven’t seen the movie yet, but I’ve heard some good things about it. I really enjoyed this book and its short chapters meant it was easy to read in short snippets of time. I read three picture books – Bruno the Boisterous Blue Dog from the Bush by Robyn Osborne, Who Dresses God? by Teena Raffa-Mulligan, and It’s Not Scribble to Me by Kate Richie. I loved all of these books. Picture books are always great fun to read and I loved adding these to my picture book library. Max Booth Future Sleuth: Stamp Safari by Cameron Macintosh was read one and a half times as I read it to myself, and read half of it to my son while waiting in hospital before he fell asleep! The last book I read during November is The Magical Unicorn Society Official Handbook by Selwyn E Phipps. My local librarian saw this and told me about it, putting it aside so I could borrow it next time I went to the library. This was a fun book with a number of insights into unicorns. As I’m currently working on a book about unicorns, it was great to read what others have written. I also managed to start We That are Left by Lisa Bigelow and I’m looking forward to finish it during December. What books did you read during November?